Filled with complicated familial obligations, scandalous secrets, British and American culture clashes, love's revenge, and an endless parade of mysterious new acquaintances-- the oeuvre of Henry James easily lends itself into the hour long adaptations for Affairs of the Heart. A sophisticated and intellectually soapy pleasure you don't have to feel guilty about nor hide the fact that you watch to friends (unlike, say, Gossip Girl), the ITV two series run of the program in 1974-1975 is now finally available in its entirety from Acorn Media. Moreover, this second series releases one year after they brought the first half to the United States in October of 2008 as another 2-disc box set. 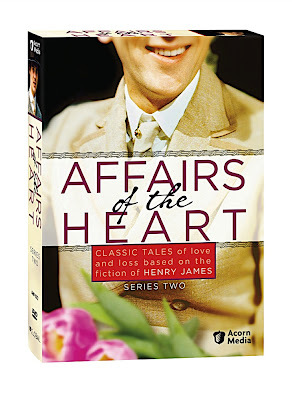 Similar to the inaugural series, these six striking episodes were derived from primarily the author's short stories and likewise contain both some of his best known classics as well as his more obscure or often ignored pieces. Including Daisy Miller and The Great Condition among others-- when the works of James are distilled down to their essence, I personally discovered that unlike most adaptations, my appreciation for the author grew considerably. Despite my particular fondness as a reader for the novellas of James, his decision to craft exquisite yet far too intricate descriptions of a single room that could go on for the length of a contemporary chapter in a few of his works lessened their overall impact and enjoyment. Furthermore, there was something about the stylistic storytelling technique he used that pushed you away from his main characters instead of drawing you into their plight. Unlike the immediate sensation that we were nearly in the room with the characters created by his good friend Edith Wharton (with whom he shared character names via Wharton's Age of Innocence and James' Portrait of a Lady), it was challenging to distinguish what exactly the motivation was of James' individuals underneath the exquisitely written descriptions. Luckily, it's precisely this problem that the medium of television is able to correct instantly in creator Terence Feely's Affairs of the Heart. As opposed to the more free-flowing nature of reading a book, the talented collaborators bringing the tales to life had to adapt them at their very essence. Yet instead of feeling shortchanged by the cuts, seeing the novellas, novels, and stories presented to this articulate of a degree (and minus extra padding) makes you keenly aware of overlapping themes and James' personal preoccupations in plotting which make us far more curious about the intriguingly feminist man scribbling away at his desk. Additionally and especially in two of the strongest episodes included-- namely “Bessie” and “Elizabeth” based upon An International Episode and The Great Condition respectively-- we become acutely aware of James' clever ability to teach us a lesson about soapy gossip by inviting us to make a judgment about a given character or situation. Habitually, just after we've tried to analyze the truth in the storyline ourselves, it's fascinating to dissect just how often James must've reveled in proving readers wrong by revealing the truth in the most unexpected and dazzling reversal at the end in ways for which we weren't prepared in the slightest. In doing so, he makes us realize just what it must've been like in that era when one's reputation could be ruined by a misunderstood joke, the right lie from the wrong enemy, or our inability to break through the simplest of taboos to ask somebody point blank if they were interested in them romantically (even though I've never been able to nail that last one). Thus, Affairs walks the fine line of an adaptation without the cool museum-like feel all the while ensuring we don't forget the person responsible for the episodes by accentuating just what it is that made them work so well in the first place. As without being able to identify the principals, we would've completely missed out on their principles which would've been to the peril of the success of a TV series since character and plot must be intertwined to ensure the scripts make sense. Despite this, I'm convinced that no matter who portrays the character, Daisy Miller is one of the most annoying literary heroines in all of creation and, as we witnessed in Peter Bogdanovich's excruciating film starring Cybill Shepherd, she's therefore best left to the page. Yet at least in Affairs we get a better sense of what he may have been trying to get across without hitting us over the head with the unlikable actions of the dim young woman who ventured from flirting into manipulation to her ultimate peril. While aside from Miller, Affairs offered only one other work in the set which I found nearly unbearable. Namely, this consisted of the irritating “Kate” based on The Bench of Desolation, which I'm unsure translates well into any medium and it's unfortunate that “Kate” preceded “Daisy" in the series. However, fortunately the rest of the works are extraordinarily beautiful and timely. Although I abhor the word “cougar,” the timeliest of them all concerns that very phenomenon (and also reminded me a bit of the film Being Julia), via the episode inspired by Nona Vincent as it concerns an older woman's love for a younger man and the way that muses and art can translate into love. Yet James was always at his best when it concerned heartbreak as well as the way that Americans and Brits never quite managed to speak the same language when it comes to romance. This is especially appreciated in the disc's book-end episodes with the opener “Emma” based on Lord Beauprey and “Elizabeth” based on The Great Condition which, much like the similarly themed “Bessie” take a feminist stance in terms of courtship and engagements. Given the culture clash between the two countries and our attitudes regarding one another in terms of prejudice or admiration (and often involving them going hand in hand), there's a comedic edge to some of the works including “Elizabeth” where two British men are determined to uncover an American Midwestern widowed piano teacher's deep dark secret. Although “Elizabeth” is tongue-in-cheek as written, “Emma” feels like the relatively dramatic set-up of what has now become the basis for contemporary Hollywood rom-coms where two individuals feign an engagement or relationship for whatever reason only for true love to get in the way. While admittedly visually it's a bit dated in the transfers, they are essentially on par with Upstairs Downstairs and it's not nearly as distracting as some British television imports from the era that weren't archived or preserved properly. Moreover, Affairs actually bests Acorn's witty and irresistible screwball mystery release of the first Beiderbecke installment-- The Beiderbecke Affair-- which was made in the '80s in terms of overall clarity in both picture and sound ensuring that great pains were taken to make the Affairs look their best.